With sunshine streaking through the restaurant’s wide windows, it’s hard not to feel happy inside The Fountain on Main. A ‘50s style diner splashed with bright colors of blue and red, not only the atmosphere, but the food as well, make the diner a must-go for all Wittenberg students. Although The Fountain on Main is only open Monday through Friday from 10:30 a.m. until 4 p.m., making time in students’ days is well worth the experience. If students aren’t paying attention, they could walk right past this delicious diner. However, the windows provide a glimpse back in time to the ‘50s. With a sleek counter taking up all the space behind the windows, students won’t want to miss this diner. The menu might not be much, but everything is cooked fresh, and the wait time is virtually non-existent. While students are seated in glittery red chairs, they won’t spend too much time waiting on service. Depending on how busy the diner is, students won’t spend more than fifteen minutes awaiting their delicious meals. On that small menu are plenty of delicious options for even the pickiest of eaters. From grilled cheese to hamburgers, The Fountain on Main offers a wide assortment of lunch rush sandwiches. It also has soups, salads and sides that compliment their sandwiches greatly. One of The Fountain on Main’s specialties is their signature Soda Shop Burger, which features its take on a cheeseburger and its own special sauce – something students will have to taste to believe its deliciousness. The interior of the diner also sets the scene for the experience. With pale blue walls, car memorabilia and old-time signs for items such as Coca-Cola, the space in the back of the diner feels much more open than it actually is. At the front of the diner resides that ‘50s style counter and barstools for easy seating. Sitting up here, students will seemingly get the full experience that this diner provides, especially with the view into parts of downtown Springfield. 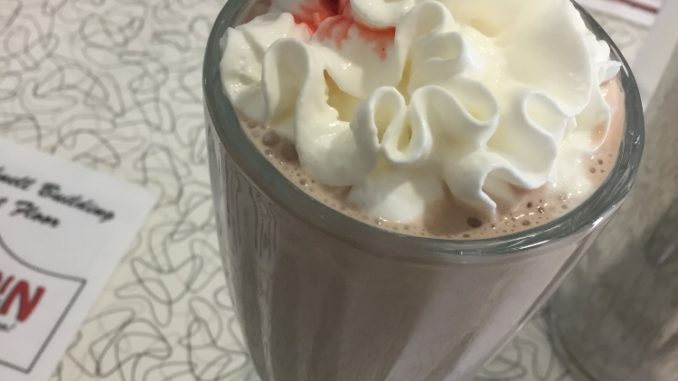 While students may order various sandwiches and sides, something students must try are the diner’s milkshakes. Smooth and creamy, the milkshakes come in three flavors: vanilla, chocolate and strawberry, and will top off any meal students consume in the diner. Served in a tall, decorative glass, students’ mouths will be widening when the server places the milkshake in front of them. A complete bonus, The Fountain on Main, located at 14 East Main Street, is only a four-minute drive from campus, or a nineteen-minute walk – and this diner is completely worth the walk if students don’t have a car on campus. So, grab your buddies or your girlfriends and take the trip off-campus for lunch sometime soon. With special deals every day of the week, students can try something new and delicious each and every time they visit The Fountain on Main. It might even take your place as your go-to spot for lunch during the week. Wonderful place to have a lunch date very friendly staff excellent great atmosphere.